Yesterday afternoon I decided I needed to make Christmas cards. Everything else could wait: doing something nice suddenly seemed important. 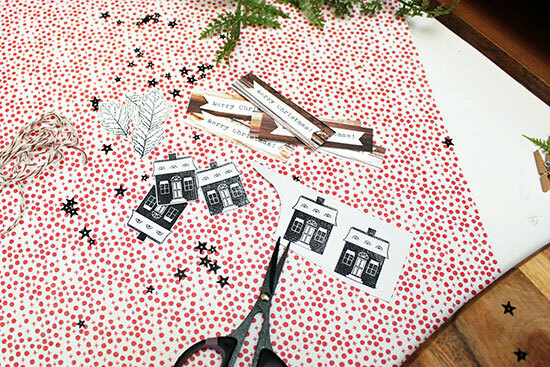 So I hopped upstairs, because I knew I had a couple of sheets of lovely red patterned paper and a little house stamp set aside from my November Gossamer Blue kits, for this very activity. I like to do something with a house motif every year, so as soon as I spotted this little stamp I knew where it was headed. Next, I found I had some tiny leaves already stamped and cut out on my desk, so I started playing about and this is what I came up with. All year I save up my scraps of white cardstock in case I need them for Christmas cards (and after Christmas I force myself to get rid of the little pieces I haven't used, so I can start collecting all over again). As I have absolutely no talent for stamping, and admire very much those who do, I often stamp and then trim so I can safely bin the rejects without also having to bin the project. A big background stamp I can just about manage: here it is. It's been in my collection for years now, so I've lost track of where it comes from; but I thought it would work as a base for my cluster. Then, a bit of stitching for a border: you can see that I placed my beginning and ending place where I knew it would be covered by a leaf; and that, after making a first card, I decided to add two rows of stitching to the next batch. Looking again at my first card, I thought it needed a little sparkle, so I went back to it and added some tiny, sparkly stars from Felicity Jane. Is it finished now? I'm not completely sure. But it's a start. And I still have that red patterned paper to play with.. It's a lovely and charming card! I like everything about it. I love your Christmas cards Sian! I think we all need to get into the Christmas spirit ASAP this year! 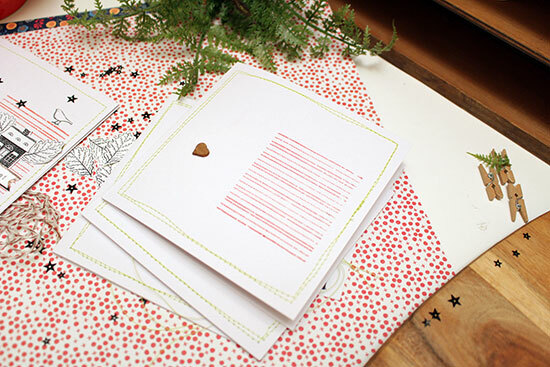 Nothing like a bit of something creative for soothing the soul ... And your cards are so you! Quirky, stylish, with a bit of stitching of course. Feeling uplifted, just reading your post :). Your cards are always beautiful, Sian. I love this card! Great how you do them production style. I've been thinking about Christmas today. I saw your post on Instagram and was so curious about how you were using those houses. I'm glad I found my answer here - those cards are lovely! Happy Christmas Card Dance! Whooo hoo! You started! off to a card party myself tomorrow and I can't wait!!! I always love your cards - you always come up with something very original and very 'you' and this year is no exception. It is one big Christmas cardfest here at the moment - only 9 more sleeps to my fundraiser and I am surrounded by so many half finished cards LOL!! These are looking simply DELISH! You did made me giggle with the stamping issues, tho!!!!! I have a MISTI.... solved it for me!! Lovely - I like the stamped background and cluster. I like stamping and trimming out to give a bit more depth too. Have you tried stamping on a mouse mat or similar? I find that helps give a cleaner stamped image. They look lovely and you are well prepared. 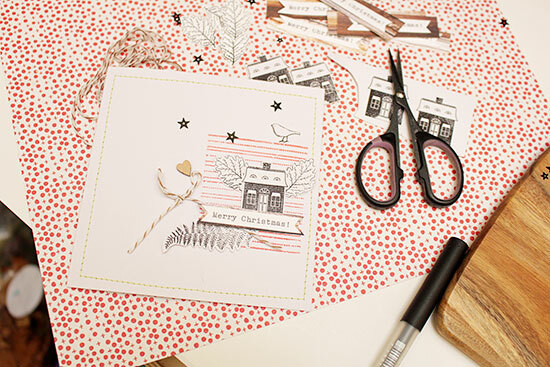 That is a very cute stamp, I save supplies for Christmas cards and then always run out of time to make them! 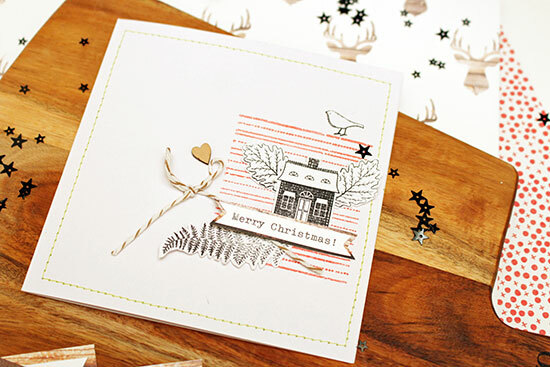 Such a cute card and I'd spot it as yours in a pile of cards :) I love the background stamp. I do the same with stamped images and often use the foam pads to raise them up. I really like the unused paper, look forward to seeing what you do with it!